When you hear the word “orthodontics,” what comes to mind? Probably a young teenager whose teeth are covered by a latticework of metal. There are indeed many orthodontic patients who fit that description. However, there now exists an increasingly popular alternative to traditional metal braces: Invisalign® clear aligners. We want all of our Fairfax patients to know that Dr. Kaur is a certified invisalign provider! In the past several years, two features have been added to make Invisalign a more appropriate orthodontic treatment method for teenagers. Special “eruption tabs” hold the appropriate amount of space open for molars that have not fully grown in. Invisalign for teens also comes with “compliance indicators” built into the aligner material, which fade with wear. This allows parents, dentists, and the teens themselves, to make sure the trays are being worn as prescribed. Treatment with Invisalign can only be successful if this is the case. 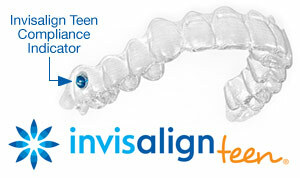 You can read more about invisalign teen here . For more information on invisalign treatment, or to schedule your appointment with Dr. Kaur call us at (703) 267-6103 today!